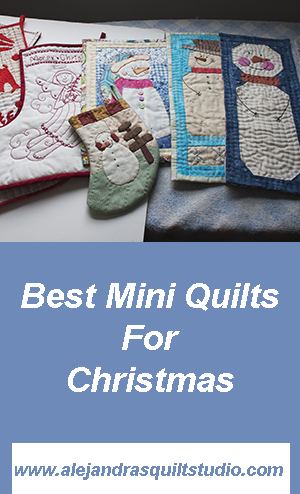 Christmas is around the corner and nothing is better to decorate the house for the holidays than some mini quilts for Christmas. I always love to make mini quilts, they are always easy and fun to make and it doesn’t take long to finish them at all. You can make mini quilts in many sizes, from the tiniest that only could be a couple of inches per side to bigger size that you can hang on a wall, and it will look amazing in any wall in your home. One of the best things about making mini quilts is that there’s no rule to make them, you can make them small or tiny, you can make them square or circle, and you can even make it with a totally different shape as the mini quilt I made a few weeks ago with the shape of a star. Amazing Benefits of Making Mini Quilts. Making mini quilts can bring great benefits to any quilter or any person who loves to sew. Making a mini quilt won’t make you break the bank. They will always be great to decorate a house and they will give to any decoration that touch to make a house a home. 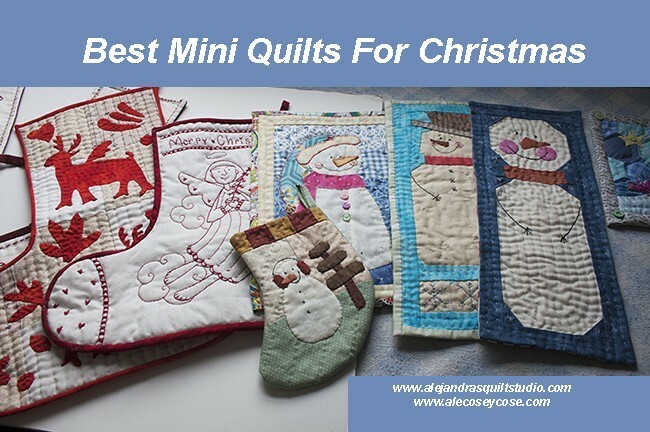 Mini quilts are perfect to give them as a present. When you work on them, you can take them with you, waiting for an appointment or going to your kids after school classes, will be nicer when you work on a mini quilt while you wait. You can make many of them and you will always find a new one to make. My Blog has the amazing number of 100+ blog post now! Today I’m happy to share that this blog has the amazing number of 100 blog posts on it, I’ve been sharing my love to make quilts and my adventures as a quilter living in Quebec on this blog, and I’m so thankful with you that you have read my posts and now you have become my follower. Today, I would like to share a little bit more about my life in the beautiful province of Quebec and how I decorate my house for the Holidays. So I’m going to give you a virtual tour of my house. My House During The Canadian Winter. Canada is known as a peaceful and beautiful country, my life here is just like that, I live in a beautiful spot in the country and life here is quiet and nice every day. But Canada is also known by the long and hard winters, one sample is the photo above, my house and my yard all covered with snow this past week. Winters can be cold, long and with lots of snow, which invites anyone to stay at home, every time I share some photos on my Social Media from snow storms, I get comments about how can I live in a place like this? Here it’s when quilts come to my rescue, being a quilter is like living in paradise on Earth, I know I’ll be inside most of the time during those long months of winter, but inside I live in a comfy and nice home, working on my quilts and this helps me to be busy doing what I love and I don’t even notice the time, and before I notice it’s Summer again. I can look back and I see a few quilts done, then it’s when I realized that the past winter was a long one. I can say I could measure time based on how many quilts and mini quilts I did. Today, as I opened the drawer when I keep all the Christmas related mini quilts and other quilted items, it’s when I realized I have today a small collection of them. If you allow me, I will give you a small tour to my Canadian home and to my mini quilts collection. I moved to Canada 8 years ago, I came to live in the country in a small old house, it was built in the last years of 1800, but it’s a nice and very comfortable house to live in. This house was built with logs, so I’m proud to say I live in a “Log Cabin”, despite the years this house has, everything is well-kept and we (my husband and I) live very happy here. It’s a small house but it has everything we need, and it’s easy to keep it clean and tidy and the most important for me is that I get lots of free time to work on my quilts. As you can see, I live in the country but I have a small artificial Christmas tree, how come this can happen?, you may ask. Well, I will let you know the truth, in our back yard, we have some trees, among them every year I see little evergreen trees growing there, the Christmas I spent here, we got one of those small evergreen tree in a pot and we brought it inside, I decorated it for Christmas, on next Spring we took it back to the back yard and we planted it again, everything went well. That little evergreen tree is doing great today. The second year, we did the same and everything went well, but not on the third year, that little evergreen tree didn’t make it at all. From that day, I decided not to do that again, and I’m happy now with my artificial little Christmas tree and every time my husband and I go out for a walk in our back yard, we see those young evergreen trees growing good there. For me, nothing is more Christmas than some ornaments in red and white. This is why I have made a few things with Redwork. One year I made this mini quilt with a shape of a heart with some Redwork embroidery on it. It was a free pattern and a tutorial, I made it for a blog I used to have, sadly I didn’t save the pattern in a USB and I don’t have anymore the computer I used to use then, so I lost the pattern. Everybody Come Home For Christmas. This is a small Christmas quilt with some embroidery blocks to tell about why everybody come home for Christmas. There are many reasons why Christmas is always better when you join your family to celebrate it, being at home, spend some days with your family, the Christmas tree, Christmas pudding and of course some presents. Happy Christmas is a small wall hanging I did a few years ago with Redwork embroidery with DMC embroidery floss, easy to make and it might take a couple days to finish it. Nothing too elaborate to do, just one thin border in the four sides of the embroidered block and then a wider border, some hand quilting on both borders and the wall hanging will be ready to decorate any wall in your house. If you have followed me for a while, you might know already I like to try new things from time to time. 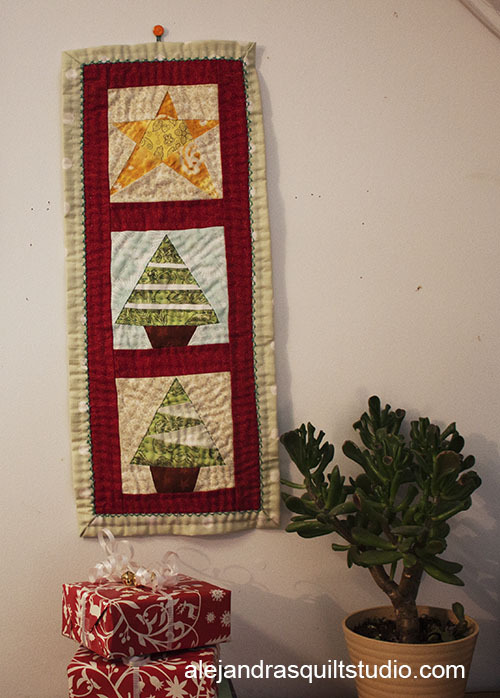 This table runner is so cute that it has become one for my Christmas mini quilt favorites. I have it displayed all year round on the top of a book self, it’s made on different colors from Christmas, some gray, beige and green fabrics, but with cute snowmen faces on it, on each block you will find a happy snowman or a happy snow girl. I can remember when I did this mini quilt with a Christmas tree on it, I loved to make it, it’s so easy to make it as it’s made with triangles and squares of fabric. Two borders, one in beige fabric and one in red fabric, and it’s finished with self biding. You can find the tutorial to make this Christmas mini quilt here. It’s always fun to work on small quilting projects like making a hand towel. Hand towels are easy to work on and they don’t require batting fabric. I wanted to try something different to decorate a Christmas hand towel, I worked with a Paper Piecing pattern to make the snowman, and I just added two pieces of fabric to match the width of the hand towel, I just did a few big stitches for the hand quilting and the hand towel was ready. You can find the tutorial to make the Snowman hand towel here. Hand Towel With A Cute Snowman. One Christmas hand towel is never enough, so I had to make a second one, this time with a cute snowman face on it, this paper piecing pattern is easier than the other one, you can make this hand towel in no time at all. One of my favorites! I also have this mini quilt displayed all year round in the house, you can see here how the wall of the house are made from logs. I love the texture and the atmosphere the log walls give to the house. This mini quilt was made with six easy paper piecing patterns to make, I don’t have anymore those patterns, but I will work to make them again to share them with you, I will let you know when I get them ready, you might want to make this mini quilt for next year. You can take a sneak peek to my 2018 Journal Quilt on this photo, you can read more about it here. Snowmen are my favorite to make mini quilts, today I have no doubts about it. I’ve already a small collection of mini quilts with snowmen, so let’s begin the tour with this one. Simple and cute, easy to make, paper piecing patterns, it won’t take long to make it and to finish it, and it will add that Christmas rustic look to any corner of your home. I don’t have the pattern to share to make this mini quilt for the moment, I made this mini quilt as a personal project, but since that day it became one of my favorites. To make this pattern again to share it with you is already written down on my to do list for 2019!. Mini Quilt with a snowman with paper piecing. You can find the full tutorial to make this Snowman mini quilt here. 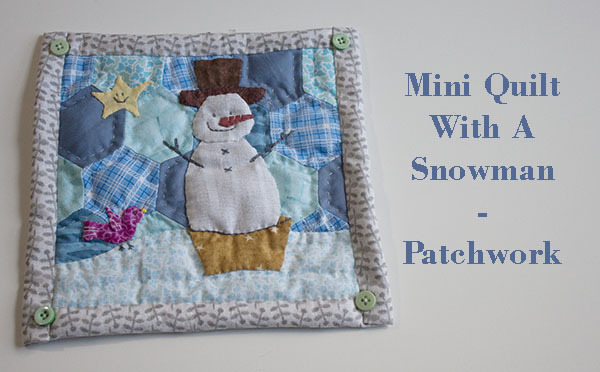 You can read the full tutorial to make this mini quilt with a cute snowman here. I made two small Christmas stockings for my grand children this year, you might have read the tutorial already, but in case you haven’t, you can find it here. 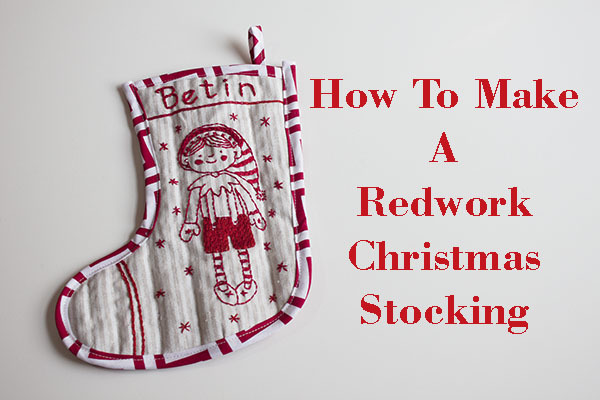 I made this Redwork Christmas stocking about 8 years ago, I never did the pattern as I made it before I had a blog where I could share my quilting and embroidery work and patterns. I think this Christmas stocking design will always be nice to make, so I will also write down this pattern to be made on my “To Do List” for 2019. 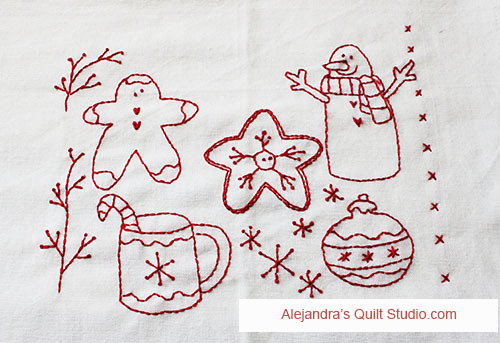 You can make small Redwork embroidery on some sewing projects for Christmas, they are so easy to make and they will always look cute. You can read this blog post and get the free pattern to make them here. A simple applique to make on a Christmas stocking, this Christmas stocking is the largest I made, it will be perfect to write a long letter to Santa and ask for some Christmas presents for a quilter as a new rotary cutter, a new pair of scissors, a few fat quarters of fabric and a new patchwork ruler. Don’t forget to add on that letter to Santa a new thimble, some pens and pencils for fabric, new pins and safety pins. I think this could be a long letter to Santa! I never did the pattern to make this Christmas Stocking or the tutorial, but today it forms part of my private mini quilt collection. A Christmas Stocking with a cheerful snowman! This is the smallest Christmas stocking I’ve made, I made it a few years ago, I also made this with fabrics with soft colors and prints that the normal colors or prints used for Christmas. I made this Christmas stocking as a part of a tutorial I shared in an old blog I used to have, I must look for the patterns to share it with you, I will let you know when the pattern is found and ready to share it on this blog, so you can also make it for Christmas 2019. I’m sure you will love to make it! Oh, I must say, this Christmas Stocking size is perfect for small Christmas presents, I’m sure you will have some great ideas already to write on your letter to Santa! Make a Christmas Mini Quilt. There’s always time to make one more mini quilt for Christmas, and I’m sure you will love to make this one! This mini quilt is made with three small Christmas tree made with paper piecing and a simple border, it can be made in a few hours. You can download a Paper Piecing free pattern to make one of the Christmas tree to make the mini quilt here. I don’t know about you, but I always think about some elves when I think about Christmas! Redwork is so easy to do, and anything you make with it, it will look great! I made this Christmas garland a few years ago (about 8 or 7) as a part of a tutorial I shared in an old blog, I’m sure you’ll love to make it, so I will add it to my “to do list for 2019” I’ll let you know when the tutorial is ready. I made this tutorial last month, I loved to make this mug rug with a shape of 8 points star, I’m sure you may love to make it, so I add the link here so you can find it to make. It can be used as a mug rug or as a small table runner, this year I’m using it as a base for my Christmas tree. Well, I’m sure you might have a few ideas to make for this Christmas, and a lot of ideas to make for Christmas 2019. Making mini quilts is always nice, they are nice and easy projects to make, and you never get tired of making them. They are perfect to help you to add that rustic touch to your home, but they are also perfect to give them as a present and tell that person how special they are for you. When you give as a present something you made by yourself, you give also a little part of you. Mini quilts are always a good way to say “I love you” to someone special for you, whether he or she is part of your family or is a friend of yours. Don’t forget you can follow me on my Social Media and get the updates of my quilting work and more! I thank you as always to make the time to stop by and read my blog. I also thank you for sharing this blog with your friends! If you’re looking for a quilting machine to make some of these mini quilts, you can take a look to my picks here! If you find some ideas to make later on this blog post, don’t forget to PIN it so you can find it later. This appears to me to be a great way to take on small projects without a huge investment or a very challenging education processt; am I correct? This seems like a great hobby for my son’s wife to take up, allowing her to stay busy and relate without struggling too much with the language (she is an asian immigrant). My daughter-in-law is new to quilting, so I wonder if it is feasible for her to take on a mini-quilt project. What skills will she need and what tools or equipment are required for her to get started? Thank you so much for making the time to visit my blog today, yes, mini quilts are a great way to take on small projects without breaking the bank, you can make a nice mini quilt with a few pieces of fabric and it will look great. I always love to hear from new quilters, I’m sure your daughter-in-law will be a good one soon, I think she might like to make one mini quilt as a starting point, a mini quilt is always easy to make and you can display it anywhere ! Your daughter-in-law will need a few quilting tools for a start like the rotary cutter, the mat, and the patchwork ruler, she also will need a sewing machine with quilting feature, you can take a look to my suggestions for a sewing machine. Hello Alejandra and thank you for this amazing article. It was such a nice read. I like your writing style. This is my first time here but not my last time for sure. My grandma was into quilts and different designes and our househould still has these old quilts. She was a really a master with quilts or artist would be a better word i think. Your quilts look amazing. You gave me a lot of ideas which I can use for my house. Christmas is always a special day and we always feel special around New Year. Your house is aweome, ready to celebrate Christmas the it should be celebrated. Thank you so much for making the time to read my blog today, I always love to know about other quilters and I’m sure your grandma was a good one and as you said she was an artist. You are so lucky to have her quilts today, every quilt is a piece of art and I’m sure you will treasure it and you will find a place to keep them at home. I thank you for your kind words about my house, yes today it is ready for Christmas! I’m glad to meet you here, it’s always nice to meet another quilter, because I know you’ll be a good one soon! There are fabric stores where you can get the cotton 100 % fabric that is used to make most of the quilts, I hope you can find one near you. If you don’t, you always can get some fabrics online. I use to visit a fabric store at Montreal, I use to visit this store about 3 to 4 times every year as it takes me one hour to get there. There’s another crafts store in a small city close to home, but they don’t get as many cotton fabrics as the store at Montreal. Yes, it’s easy to learn and my tutorials are in Spanish you might find them helpful for you. Me encanta estar en contacto contigo ahora. Wish I lived there !!! My health is so much better when it’s cold. Enjoy your precious days.